Wood shades have been around for a very long time. Now, they get another great addition to their family with the Tavarua Exotic Woven Wood Shades. These woven wood shades are made with a roman fold style lift. This will be a special treat for anyone who has seen bamboo shades raised before since it creates a “waterfall like” look on the window and a smooth flat bamboo face when lowered. Tavarua bamboo blinds may also be referred to as matchstick blinds or woven wood shades. To create an exotic look, these blinds are woven into a light filtering window covering that is full of character. Each Tavarua woven wood shade comes with color coordinated cords and tassels as well as a matching 6-inch valance. Edge bindings are available for the entire Tavarua line of bamboo blinds to help protect the delicate edges from cracking or breaking. Blinds Chalet announces free privacy/blackout liners on their line of Tavarua Bamboo Blinds (excluding Tavarua Basics) with the purchase of four or more Tavarua blinds. These window treatments are also referred to as matchstick blinds or bamboo shades. To create an exotic look, these blinds are woven into a light filtering window covering that is full of character. Each Tavarua woven wood shade comes with color coordinated cords and tassels as well as a matching 6-inch valance. Tavarua’s bamboo blinds line is available exclusively through Blinds Chalet. Blinds Chalet announces free edge bindings for their entire line of eco-friendly bamboo shades(bamboo roller shades excluded). Edge bindings add color and style to bamboo shades as well as protecting the delicate edges of the bamboo from splintering, catching or breaking. Bamboo products are a sustainable resource as they grow like a weed – 1 to 4 inches per day, can grow in virtually any climate and require very little water to sustain. Bamboo does not require pesticides or insecticides in order to grow safely. 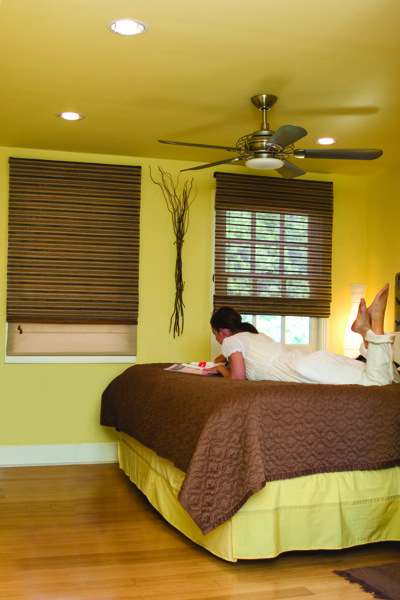 Blinds Chalet announces ½ off privacy liners with the purchase of four or more Tavarua Matchstick Shades. Matchstick shades, otherwise known as woven wood shades or bamboo blinds offer light filtration with an exotic, South Pacific feel. The free privacy liner, or blackout liner, allows for controlled privacy when needed. During the day, the light filters through the matchstick shades to cut the sun’s glare while still allowing a breeze to flow through. Most people know matchstick shades by their more popular names – bamboo shades or woven wood blinds. They are one and the same thing. Matchstick blinds are basically woven wood blinds that give a room a South Pacific or tropical feel. They are the perfect accent piece for any room, apartment or guesthouse. Because of the natural quality to the blinds, each window treatment is slightly different although color matches will stay the same. It wasn’t so long ago that when we had a question we had to make a trip to find the answer. The trip might have been to a neighbor’s house, to the library or to a hardware store. We were more social back in the day. Today, consumers want information right away. It takes time from a busy schedule to stop by a neighbor’s house when the same information can be found in a few minutes by a Google search. There is a huge appeal to using bamboo in homes. It’s environmentally friendly. It’s sustainable. It helps preserve forests of oak, pine and maple. Because of how quickly it grows - several inches per day, there’s no need to worry about bamboo going extinct. Bamboo also gives an exotic feel to houses and office spaces. There is a Pacific Island feel that comes with woven bamboo products. Bamboo has come into its own over the last few years. From textiles to construction materials, bamboo is proving its strength and versatility have a lot to offer. The most recent segment of the home improvement industry to benefit from bamboo is window treatments. Bamboo grows like a weed. Even after cut, the root system stays in tack and new trees grow. Unlike pine and oak forests that take decades to recover, bamboo is considered a sustainable resources because of the resilience and speed with which it grows back. Bamboo is becoming a substitute for wood on many levels. From houses to flooring, cabinetry and even window treatments, the benefits of bamboo are creating a surge in demand for this product. Because bamboo is a sustainable resource, meaning it replenishes itself in a short amount of time, growing demand doesn’t deplete bamboo forests or cause the long-term devastation to habitat that logging oak, pine or other woods does. Blackout blinds are designed to block the light from entering the room. Whether you need a dark room for sleeping or just to watch TV, there are multiple options for blackout window blinds and shades. Here are a few options for the best blackout blinds. Move over vinyl vertical blinds, the new bamboo panel track blinds are here. This updated twist on vertical blinds brings class to any room. Bamboo is a sustainable resource, meaning that bamboo can replenish itself before it gets over-harvested. Bamboo is famous for its regenerating abilities. It grows like a weed and survives off rain instead of millions of gallons of water, like cotton. Bamboo window treatments are woven from various strains of the wood in different shades and textures. The woven pattern filters sun, creating a glow in the room when they are closed. Bamboo panels can be paired with blackout shades for complete privacy. Most companies that sell bamboo blinds also sell a matching valance, however some include the valance for free. Blinds Chalet's new Bamboo Track Blindsare made from all natural bamboo. The sliding panels work as an alternative to vertical blinds and are eco-friendly. Each bamboo panel track slider comes with a matching bamboo valance to hide the headrail. The blinds also come with and edge binding to protect the bamboo edges. Optional wand controls are available to ensure child safety. Liners are available for additional privacy and light control.